5.7 Was HBG working for MI6? The Guardian reported in May 2016 that the UK government was outsourcing the running of media operations for the Syrian opposition. The contract documents seen by the Guardian were reported to be dated November 2014, but an earlier contract is mentioned. The Guardian states that the effort to manage Syrian opposition media dates back to the aftermath of the failure to get the House of Commons to vote for war in August 2013. Contractors hired by the Foreign Office but overseen by the Ministry of Defence (MoD) produce videos, photos, military reports, radio broadcasts, print products and social media posts branded with the logos of fighting groups, and effectively run a press office for opposition fighters. The contract to support the moderate armed opposition was briefly held by Regester Larkin, an international communications consultancy, where it was headed up by a former lieutenant colonel in the British army who had also worked as a strategic communications specialist at the MoD. He set up a company called Innovative Communications & Strategies, or InCoStrat, which took over the contract from November 2014, a Regester Larkin spokeswoman told the Guardian. A report by Rania Khalek in December 2016 described how an unnamed reporter had been offered $17000/month to work for this operation. The redacted emails are dated June 2016, and the contractor offering the job states that they are one of "three partners" of the UK government on "media surrounding the Syrian conflict". This implies that InCoStrat is not the only contractor. Regester Larkin was acquired by Deloitte in December 2016. It was described as a "crisis, issues and reputation management consultancy", so running information warfare ops isn't exactly its core business. None of the six current partners have a military background. It's surprising that a consultancy specializing in "reputation management" would get involved in something so obviously disreputable and likely to blow up in their faces. It's not surprising that they divested themselves of the contract after a short time. January 2017 - current. Refining the work developed in InCostrat to provide a more tailored product to both the public and private sector. July 2013-December 2016- Founder and COO of InCoStrat. Developed and managed the company for over two years building to a peak of over 80 staff working in five countries providing strategic communications and local insight in hard to reach areas that are in conflict or emerging from it. • 2012-current. Developed and Project managed several multi-million dollar media and communications projects that are at the leading edge of UK and US foreign and security policy objectives in the Middle East"
The dates "2012-current" suggest that UK government operation of Syrian opposition media dates back further than the outsourcing contract described in the Guardian article. An operation with "over 80 staff" implies a much larger annual turnover than the £2.4 million mentioned in the Guardian, so the Conflict and Stability Fund is probably not the only source of funding. a small, fairly new organization in the business consulting services industry located in Washington, DC. It opened its doors in 2014 and now has an estimated $72,000 in yearly revenue and 1 employee. The UK government contract of £2.4 million and the 80 staff described by Tilley don't match the description of this business as having one employee and annual turnover of $72000. Wikipedia describes an LLC as a "business structure that combines the pass-through taxation of a partnership or sole proprietorship with the limited liability of a corporation." Incostrat's address is given as 106 Quincy Pl NE, Washington, District of Columbia 20002-2145. This terraced house in a residential street is also the address of a local air-conditioning contractor. Tilley's Linked-In page states that he is also the founder of Innovation and Insight FZE ( iN2- Comms), based in Istanbul. The activities of iN2-Comms are described with in words identical to the description on InCoStrat's website. An article behind a paywall is headlined "Syrian rebels’ British flack bounces back with In2-Comms". From their Linked-In pages, another UK national at In2-Comms is Kate Henson (Director of Leadership Consulting and Innovation). Kevin Stratford-Wright was a Lt-Colonel in the British Army till 2012, where his last position was as Head of Information Operations for the regional HQ in Afghanistan. His next job was in the Ministry of Defence as a civilian. • Established a Strategic Communications programme to support UK government policy in a conflict zone. • Developed strategy and plans. • Engaged across the UK government (and internationally) to win support and approvals and to secure funding. • Developed Statements of Requirement in partnership with selected enabling-contractors. • Monitored and coordinated multiple project strands and reported on their activities and impact across UK government and to international partners. • Generated year on year efficiency savings through constructive engagement with enabling contractors. • The programme has been recognised as the UK’s largest of its kind since the Cold War. Its approach has also recently become a template for activity elsewhere (accepted by both UK government and international partners). Clearly the StratCom programme that he was running is the UK's operation in support of the Syrian rebels. He tells us that it was the UK's largest programme of this kind since the Cold War. This flyer for a conference on "Information Operations" in 2012 has both Stratford-Wright and Tilley as speakers. The founder [of SNHR], Mousab Azzawi, and the onemanshow of the Syrian Observatory, AbdulRahman ( alias for Osama Ali Suleiman), have exchanged fierce barbs each claiming the other is a sham. Abdulrahman, originally of Finnish nationality, was on the board of UK Consulting Centre, LTD for a little over one month in 2008, while Mr. Azzawi is currently listed as this company’s Director. In addition, Azzawi was listed as a Trustee of the Syrian Observatory in 2012, a tangled web indeed! "The UK Consulting Centre LTD. is listed as an adult education and training center with about 12k pounds in assets. Some details of how the operation supposedly began were given in a WSJ article on 23 August 2013. When reports began to surface last year of chemical-weapons attacks, the Saudis, who have close ties to rebel factions, played an important early role in collecting evidence, Arab diplomats said. This past winter, the Saudis flew to the U.K. a Syrian who was suspected of having been exposed to a chemical agent, Arab and European diplomats said. Tests performed in Britain showed the Syrian had been exposed to sarin gas. French and British intelligence agents saw the evidence as credible and stepped up efforts to track other exposures in the chaotic war zone. A spokeswoman for Britain's foreign office declined to comment. U.S. intelligence analysts, particularly those at the Pentagon, were skeptical of those initial results, officials said. Officials said they couldn't rule out the possibility that the rebels might be planting evidence to try to draw the West into the conflict. A turning point in U.K. views on weapons use in Syria came this spring. Physiological samples collected in Syria -- including from Utaybah on March 19 and Sheikh Maqsood on April 13 -- were brought to the U.K. laboratory [Porton Down] for testing. The material tested positive for sarin, Arab and European diplomats said. There's at least a hint in this article that efforts to collect CW samples from Syria were already in place by late 2012, as they were "stepped up". The soil samples from Khan-al-Assal have become physiological samples from Oteybah, following the official line of the UK government maintained from 20 May onwards. The exposure of a Syrian in winter 2012-13 was presumably used as evidence for the use of sarin in the alleged CW incident on 23 December 2012 in Homs. It's odd that this incident wasn't publicized at the time - maybe it was an accident to people handling the sarin. MI6 tests smuggled Syria soil for nerve agent This report by Tom Coghlan and Michael Evans is the first press report of the MI6 operation to collect CW samples. Government scientists at Porton Down are examining a soil sample smuggled out of Syria after a suspected nerve gas attack on rebels in the country's civil war. The sample was obtained in a covert mission involving MI6, the Secret Intelligence Service. Experts at the Ministry of Defence's chemical research establishment in Wiltshire are testing the soil for traces of sarin nerve agent. Syrian rebels claim that they have been attacked with chemical weapons by the Assad regime's forces but have failed to produce any proof. US defence officials are trying to gather evidence and the UN has announced its own investigation into the alleged chemical attack near Aleppo on Tuesday. Forensic evidence of chemical weapons use in Syria has been found for the first time in a soil sample smuggled out of the country in a secret British operation. Defence sources, who declined to be named, said yesterday that conclusive proof that “some kind of chemical weapon” had been fired in Syria had been established by scientists at the Ministry of Defence’s chemical and biological research establishment at Porton Down in Wiltshire. The discovery, which had not been made public, will put pressure on the United States to consider punitive action against President Assad. The White House warned in December that any use of chemical weapons would be viewed in Washington as a "red-line" issue. The soil sample is thought to have been taken from an area close to Damascus, where there had been fierce fighting between pro-regime forces and rebels. The Porton Down experts established beyond doubt that the traces related to chemical weapons rather than, for example, substances used to control riots. They could not tell whether Mr Assad's forces, or rebels, had fired them. The scientists were unable to ascertain whether the findings indicated widespread use. "There have been some reports that it was just a strong riot-control agent but this is not the case — it's something else, although it can't definitively be said to be sarin nerve agent," one source said. The British mission to smuggle out the soil sample was revealed by The Times last month. The Ministry of Defence would not confirm the Porton Down finding. The tests at Porton Down reportedly concluded that the chemical traces were from a weapon rather than gas sometimes used by the Syrian security forces to put down protests. It was not clear whether the sample was from Aleppo, Syria's largest city, where more than 20 people were alleged to have been killed in a chemical attack last month. The UK Ministry of Defense has claimed that chemical weapons were used in the Syrian conflict. Forensic evidence was collected after scientists analyzed soil smuggled out of the country in a secret British operation, the Times reported. The sample was reportedly extracted from a neighborhood on the outskirts of Damascus in March by MI6 agents operating within Syria, the Australian reported at the time. UK says that chemical weapons were used in the Syrian conflict, after scientists analyzed soil smuggled out of the country. The Foreign Office insisted today that tests at Porton Down, the defence research laboratory, had found “limited but persuasive” evidence of sarin use, which it described as a war crime. “The material from inside Syria tested positive,” a spokesman said. White House officials set off a fervor on Capitol Hill when they acknowledged for the first time that the United States had received some evidence that Syrian President Bashar Assad had used chemical weapons, the lethal nerve agent sarin in particular. Central to the claims of chemical weapons use are positive tests for sarin both by the Pentagon and Ministry of Defence scientists at Porton Down. The American tests are understood to have been carried out on samples of hair and blood from those affected, while those at Porton Down were on soil samples. However, while scientists are said to have confidence in the findings, the quantities involved are "microscopic". Secret British tests on an exploded bomb are thought to prove Syrian troops have launched at least one chemical attack on rebels there. Samples from the army mortar bomb were smuggled out of the warzone by agents working for MI6. Spies then flew the cargo back to the UK, where it tested positive for deadly nerve agent Sarin. A senior Western source said last night: “The British believe they have conclusive evidence, but this is a very delicate situation.” It comes after photos emerged of one victim foaming from the mouth in hospital after an apparent chemical attack and reports people suffered breathing problems and vomiting in a bombing last month. The latest results, taken five weeks ago at the military’s Porton Down research centre, in Wiltshire, have been passed to the British government, the US and France. The source said: “MI6 played the leading role but the American military wants more evidence before it agrees Assad has crossed the line in the use of chemical weapons. From the date, and the mention of "foaming at the mouth" this appears to be the Sheikh Maqsood incident. In a letter to the United Nations secretary general, Ban Ki-moon, several weeks ago calling for a United Nations investigation, Britain laid out evidence of the attacks in Aleppo and near Damascus as well as an earlier one in Homs. The letter, a copy of which was obtained by The New York Times, reported that dozens of victims were treated at hospitals for shortness of breath, convulsions and dilation of the pupils, common symptoms of exposure to chemical warfare agents. Doctors reported eye irritation and fatigue after close exposure to the patients. Citing its links to contacts in the Syrian opposition, Britain said there were reports of 15 deaths in the suburban Damascus attack and up to 10 in Aleppo, where the government and rebels have each accused the other of using chemical weapons. "15 deaths in the suburban Damascus attack is far more than any other source reported for either Otaybah (19 March) or Adra (23 March). From this report it appears that this first letter on 25 March did not mention results on soil samples. On 18 April the Washington post reported that this information had been provided to the UN. Most likely this was around 13 April, when the Times was briefed that the results showed "some kind of chemical weapon", but before 25 April, when Downing St/FCO briefed that the results had given "limited but persuasive" evidence for sarin. Britain and France have informed the United Nations that there is credible evidence that Syria has used chemical weapons on more than one occasion since December, according to senior diplomats and officials briefed on the accounts. In letters to U.N. Secretary General Ban Ki-moon, the two European powers said soil samples, witness interviews and opposition sources support charges that nerve agents were used in and around the cities of Aleppo, Homs and possibly Damascus, said the officials, who spoke on the condition of anonymity because of the sensitivity of the matter. An unusually sceptical  article in the Guardian by Peter Beaumont on 27 April stated that the Damascus incident had occurred on 23 March. New questions have emerged over the source of the soil and other samples from Syria which, it is claimed, have tested positive for the nerve agent sarin, amid apparent inconsistencies between eyewitness accounts describing one of the attacks and textbook descriptions of the weapon. As questions from arms control experts grow over evidence that the Assad regime has used chemical weapons on a limited scale on several occasions, one incident in particular has come under scrutiny. While the French, UK and US governments have tried to avoid saying where the positive sarin samples came from, comments by officials have narrowed down the locations to Aleppo and Homs. A letter from the British government to the UN demanding an investigation said that it had seen "limited but persuasive evidence" of chemical attacks, citing incidents on 19 and 23 March in Aleppo and Damascus and an attack in Homs in December, suggesting strongly that samples were taken at these locations. The suggestion that one of the sarin-positive samples may have originated in Homs has added to the growing confusion surrounding the claims made with different degrees of caution by the Israeli, French, UK and US governments in recent days. According to the US and UK governments, "miniscule" samples recovered by opposition sources and passed on to western intelligence agencies have shown traces of sarin. No other agents have been mentioned. British officials are adamant that the source of the sarin was the government and that the exposure of Syrian army troops in the town of Khan al-Asal on March 19, as claimed by Damascus, was the result of "friendly fire", a government shell that had gone astray, rather than a rebel attack. This article also gives more detail of the reluctance of Obama and Chuck Hagel to be drawn in, and their scepticism about the UK "evidence". It looks as if the MI6 operation was directed primarily at drawing the US government into an attack on Syria. This contrasts with the situation in the run-up to the Iraq war, where the US government had already decided to attack and MI6's role was to provide the "evidence" (Niger uranium hoax) that the Bush administration wanted but couldn't get its own intelligence agencies to sign off on. There is a growing body of limited but persuasive information showing that the regime used—and continues to use—chemical weapons. We have physiological samples from inside Syria that have shown the use of sarin, although they do not indicate the scale of that use. Our assessment is that the use of chemical weapons in Syria is very likely to have been by the regime. We have no evidence to date of opposition use. So by 20 May the soil samples have become "physiological samples", like the ones obtained by the Americans. An FCO spokesman confirms this to the Guardian on 4 June. (March incident in Adra perhaps should refer to the March 19 incident in Otaybah. But there was a separate Alleged chemical attack, March 24, 2013 in Adra this might refer to (2 rebels killed, thought to be phosphorous at the time and little-noted). It could be just a minor mix-up. see section on letters to the UN - it looks as if they did mean Adra, but dated the alleged attack to 23 March, and said it killed 15 people, but the samples didn't test positive for sarin. There is credible evidence of multiple attacks using chemical weapons in Syria, including the use of the abhorrent agent Sarin. We have tested physiological samples at Porton Down. These include samples from Utaybah on the 19th March, and from Sheikh Maqsood on 13th April. We believe that the scale of use is sanctioned and ordered by the Assad regime. We haven’t seen any credible reporting of chemical weapons use by the Syrian opposition. However we assess that elements affiliated to Al Qaeda in the region have attempted to acquire chemical weapons for probable use in Syria. That is the picture as described to me by the Joint Intelligence Committee and I always choose my words on this subject very carefully because of the issues there have been in the past, but I think it is right that the Americans have said what they have said and I wanted to back that up with the information and the involvement that we’ve had in that assessment. In summer 2013, it was suspected that chemical weapons had been used in Syria. DSTL’s world-class Chemical, Biological and Radiological (CBR) capability helped to provide evidence to UK and international Governments of the first use of chemical weapons in 25 years. Our scientists analysed clothing and soil samples from affected areas, and worked closely with the Organisation for the Prohibition of Chemical Weapons (OPCW) to provide S&T advice on CBR materials ahead of the OPCW inspections. Sources close to the government efforts to establish the use of chemical weapons in Syria said the contaminated clothing and other material collected in the east Ghouta suburb proved that sarin had been responsible for the deaths of hundreds in the area. The method of collection was described as "robust" with the collection of the samples being recorded with devices that registered the global positioning satellite (GPS) coordinates of the site and other "metadata" on the circumstances of the operation. The material is believed to have passed directly to British territory on Cyprus from where it was transported to the Defence Science Technology Laboratory government at Porton Down. David Cameron, the prime minister, revealed the samples had tested positive at the G20 summit and Downing St officials said the samples were obtained separately from the US and France, which have also said that sarin weapons were used in the August 21 attack. "There is a strong chain of evidence that brought this information to the UK but unfortunately the results came too late for the Prime Minister to strengthen the intelligence case," the source said. The source quoted is likely to be Hamish de Bretton-Gordon who is quoted by name later in the article commenting on the rockets The emphasis on collection method and chain of custody suggests that the samples were collected by HBG's network. This operation, from which results came "too late", appears to be separate from the operation reported by Hersh, in which he stated that samples from Ghouta obtained by the Russians were provided "very early" to Porton Down. The evidence available concerning the nature, quality and quantity of the agents used on 21 August indicated that the perpetrators likely had access to the chemical weapons stockpile of the Syrian military, as well as the expertise and equipment necessary to manipulate safely large amount of chemical agents. Concerning the incident in Khan Al-Assal on 19 March, the chemical agents used in that attack bore the same unique hallmarks as those used in Al-Ghouta. Only two labs had environmental samples from both incidents and could have determined that the chemical profiles of the sarin used in Khan-al-Assal and Ghouta matched: Porton Down and the Military Science Centre of the Russian Ministry of Defence. The UNHRC's source is likely to be the UK government, as a Russian government source would have emphasized that the sarin was low quality and not military grade. "Also of interest are contributions to the ‘Brown Moses Blog’ by a former British Army CBRN expert called Colonel Hamish de Bretton-Gordon. From his entry on the ‘Military Speakers’ website, and other material, it seems likely that he was instrumental in providing ‘environmental’ samples from incidents prior to Ghouta in which sarin was used to Porton Down. This has quite large implications. 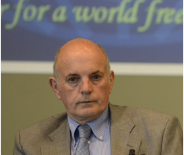 (See http://www.militaryspeakers.co.uk/speakers/hamish-de-bretton-gordon-obe/"
It's clear that Bretton-Gordon (HBG) had a key role in the MI6 operation to collect samples for Porton Down that was reported in the Times and Telegraph during April 2013. "H de B Gordon, you mentioned, is more open and has been funded by UK government since 2012 at least to develop a network of people in Syria to work on collecting samples among other tasks. " Jerrett is an Arabic speaker who has had a string of short-term jobs with UK NGOs working in the Arab world. In 2012 he was coordinator of the Syria Development Network funded by the Asfari Foundation (also funds the Syria Campaign), so he's likely to know HBG professionally and to be simply repeating in good faith what HBG has told him. The accounts filed at UK Companies House by HBG's now defunct start-up companies (SecureBio founded in 2011, SecureBio Forensics founded in 2012) support Jerrett's statement that some entity was funding HBG "since 2012 at least", but indicate that the source of this funding was concealed behind nominee directors who made "loans" that were never repaid. If this was MI6, they were remarkably prescient in anticipating before any reports of alleged CW use in Syria that they would need to "develop a network of people in Syria to work on collecting samples". On 12 July 2012, news reports suggested that Syrian authorities might be in the process of moving elements of their chemical weapons stockpile away from conflict areas to improve their security. This also raised fears that the weapons might be being deployed. On 13 July 2012, Pentagon Press Secretary George Little told reporters there were no indications that Syrian chemical weapons stockpiles have become less secure and that the US assessment, that the Syrian government continued to exercise control over the arsenal, remained unchanged. On 18 July 2012, former Syrian Ambassador Nawaf Fares told the BBC that he believed that Assad regime could be pushed to use chemical weapons and that there were unconfirmed reports that such weapons had already been used in Homs. On 23 July 2012, Syria offered a tacit admission of their chemical weapon capability, when they said that they would not use such weapons "would never be used against civilians or against the Syrian people" during the crisis for any reason. However, the government spokesman did say that Syria reserved the right to use the weapons against foreign aggressors. Given that Syria continued to maintain that opposition fighters were "terrorist gangs" and full of foreigners, Western powers and the UN warned Syria of grave consequences if they decided to use their chemical weapons stockpile to suppress the rebellion. As discussed below, the funding mechanism for HBG to collect samples appears to have been set up in April 2012, when Secure Bio went live with a split of equity that presumably corresponded to an injection of capital, and Secure Bio Forensics was incorporated as a separate company. "Dr Ahmad”, whose proper name The Telegraph will not reveal for his own protection, was responsible for collecting the samples. A first response medic working in rebel-held Aleppo, often treating the victims of air strikes and barrel bombs loaded with TNT explosive that fall on the city day and night, Dr Ahmad first took an interest in chemical weapons during an attack on the city’s Khan al-Assal district in March last year. “There was chaos the hospitals. Doctors became contaminated treating the wounded. People were so afraid and didn’t know what to do,” he said. “I studied the process of decontamination and medical treatments on the internet.” Later in the year, the doctor was part of a group of Syrian medics trained by western chemical weapons experts, including Hamish De Bretton-Gordon from Secure Bio, a UK-based consultancy, in how to react in a chemical attack and the procedure for collecting samples in the aftermath. Receiving the samples from his former pupil, Mr de Bretton-Gordon said: “Dr Ahmad’s was a perfectly executed collection of this sort of material. The samples were kept along the rules that the Organisation for the Prohibition of Chemical Weapons, the international body, require and they were presented in perfect condition that we may test them.” Once in Turkey, the testing process began. Mr de Bretton-Gordon analysed the material out of doors, staying upwind as it was likely to still be toxic. Dressed in a chemical suit, with a protective respiratory hood nearby should the wind change and blow gasses from the samples into his face, he set up the experiment. The sample from the April 11 attack in Kafr Zita yielded the strongest results. It tested strongly positive for both chlorine and ammonia. The mini-WARN detector gave a reading of 0.3 parts per million (ppm) for chlorine and 178 ppm for ammonia. As Iain Thomson, a technical expert from the UK company Secure Bio, explained, 0.5ppm is the maximum that a human can withstand for short term exposure to chlorine and 300ppm is a lethal dose of ammonia. This last statement is on the video of a later report (and I think the voice is HBG, not Thomson), so it's not just a journalist getting numbers mixed up. They're clearly winging it: 1 ppm is the maximum allowable occupational exposure to chlorine, and 300 ppm of ammonia for half an hour would cause mild chest symptoms. Colonel Hamish de Bretton-Gordon, one of the country’s leading experts on chemical warfare, has urged ministers to tighten controls on the sale of chlorine. “As more jihadists return to this country there is a growing chance [of a chlorine bomb attack],” he said. The chlorine that is often used in bombs in Iraq comes from the cylinders on the back of household fridges. Militants strip off the steel bottle and attach an explosive charge to make a simple improvised chlorine device — something that could be repeated in Britain. “Somebody could go to a waste site where people chuck away fridges [in Britain] and get a whole bunch of these things and blow them up,” Colonel de Bretton-Gordon said. Chlorine of course is not used as a refrigerant. HBG implies that he is collecting the samples to meet OPCW requirements, so it's possible that this was the route by which samples were provided to OPCW for its investigations of alleged chlorine attacks in 2014 and 2015. His comments about refrigerant cylinders containing chlorine suggest that he may have had something to do with the reports by OPCW that refrigerant cylinders were being packed with plastic bottles of potassium permanganate to make chlorine barrel bombs that were dropped from helicopters. Hm! Fridge canisters and chlorine did wind up going together, in the 2015 style chlorine barrel bombs. They were stripped out, lined with plastic, filled with hydrochloric acid, and mixed with p.permanganate upon impact, it was alleged... and not "militants" in the allegation. It is my understanding that the SyAAF does not operate at night. Night bombing only started with the RuAF. This means the reference to 'barrel bombs day and night' by Dr Ahmad is clearly an exaggeration if not a downright lie. Also, the number of barrel bombs claimed dropped - hundreds per day - exceeds the SyAAF capability to deliver them by one or two orders of magnitude. In this podcast dated 1 July 2014 from Wilton Park (an NGO funded by the UK Foreign Office), HBG states (starting about 7'20") that "in March last year there was a reported sarin attack in Sheikh al-Maqsood and I helped the Times - chap called Anthony Loyd who very sadly got shot two weeks ago - to cover this story and tried to get samples to the UK for analysis." He also confirms that he was present later with Ian Pannell in Saraqeb and says "we tried to get samples from that and couldn't - that subsequently proved positive for sarin". 1. As in his Guardian article in April 2015, HBG has incorrectly given the date of the Sheikh Maqsood attack as March 2013 and does not mention the collection of samples from the 19 March attacks. The mention of Loyd makes it clear that he's not simply saying "Sheikh al-Maqsood" when he means "Khan al-Assal". Loyd's report in the Times on (updated 26 April, but may have been posted earlier) was based on an interview with someone purporting to be Yasser Yunis, on whose home the sarin-filled riot control grenade had allegedly been dropped on 13 April killing his wife and two sons. However the VDC reported that Yasser had been killed in the attack. An examination of Loyd's bylines shows that at this time he was a full-time propagandist for the Syrian opposition, though he appears to have had a change of heart after they kidnapped him in 2014 and shot him in the leg to prevent him escaping. 2. He states that the munition used in both Sheikh Maqsood and Saraqeb was a barrel dropped from a helicopter, though on 27 July 2013 he had taken part in a detailed discussion on Brown Moses of the riot control canisters that were alleged to have been the munitions used at these sites (see below). 3. He contradicts his earlier statements that environmental samples were obtained from Saraqeb, and appears to refer to the positive blood test obtained in the French lab. Article on opposition website dated 17 April. Improvised chemical weapons are a term for chemical phosphates, a key component to pesticides that have the same biological structure as nerve agents. “I think that a lot of these events have been organic phosphates or pesticides which have been blown up,” de Bretton-Gordon said, adding that “thousands” of people die around the world from these each year. Why is he talking about organophosphate pesticides? This was four days after Michael Evans had been briefed that the samples supplied to Porton Down from the 19 March incidents showed "something else although it can't definitively be said to be sarin nerve agent". As HBG supplied these samples, he's presumably been told something of the results. The Russians were later to report that their analyses of what was presumably the same batch of sarin, obtained from the impact site at Khan-al-Assal, showed low concentrations of sarin produced under "cottage industry" conditions and containing DIFP (diisopropyl fluorophosphate). DIFP is an organophosphate much less toxic than sarin, widely used as a pesticide. It sounds as if Porton Down found this also. HBG isn't sure how to spin this - he even suggests a possible opposition false flag. So at this stage I think we can infer that Porton Down had obtained similar findings to the Russian lab, and that HBG had been told some of these findings. The only difference is that at this stage Porton Down is still not reporting a positive test for sarin: they might have reasons for withholding such a result if they don't trust MI6 or HBG. Werman: And talk about the samples. What kind of samples are you referring to? Bretton-Gordon: Well certainly the ones I've seen have been soil samples and masonry collected from the likes of Aleppo and Saraqib and Damascus. I think there have also been some clothing samples. And it's also been widely reported that blood and hair samples have been taken off refugees and people that have escaped from those areas. In an interview on discussing the Saraqeb attack posted on the BrownMoses blog HBG again suggests that the sarin was low quality. Sarin would normally be delivered by air dropped munitions or artillery shells, causing mass casualties i.e. Halabja. However, it is pretty clear that samples from Saraqeb have tested positive for Sarin, so there would appear to be very small amounts of Sarin contained in the canisters, probably of a low quality. This would account for the relatively few casualties. It is certainly not textbook delivery but has presumably achieved the effect which the perpetrator wanted – confusion and derision amongst the International Community. Hamish de Bretton-Gordon, a British expert in chemical and biological weapons, told CBSNews.com on Wednesday that, based on the reported death tolls and the available video evidence -- which he stressed he could not authenticate independently -- it appeared that a weapon of mass destruction like Sarin gas was probably involved. In many of the smaller-scale attacks across Syria, de Bretton-Gordon has said small quantities of Sarin, or far weaker organophosphate compounds, could have been to blame, and it is feasible that poorly-trained rebel forces could have been behind such attacks. "Sarin is 4,000-times more powerful than organophosphates," he explained, suggesting that if the toxic gas was used Wednesday on a large scale, it was "very unlikely" that opposition fighters could have been behind the attacks, as they "just don't have access to that level of chemical weapons and the delivery means" needed to disperse them so widely. Of course we know now that sarin need not have been used on a large scale, given the evidence that most of the deaths were massacred captives, but HBG's opinion that the rebels couldn't have been behind Ghouta was reasonable given the information available at the time. However he again gives his opinion that the rebels could have been behind the earlier small-scale attacks. The Khan al-Assal attack is different to the others, as it could be concluded that the Opposition is responsible. UN/OPCW conclude that Sarin was used mainly from evidence provided by the Russians and that the victims were Syrian soldiers. It could be the Opposition – AQ certain claim to be in the CW market – they [Opposition] could have acquired small amounts of Sarin, the Regime recently stated that they had lost some [Sarin] from Aleppo Airport and the Syrian Army soldiers were victims. It could also have been the Regime, who are probably not beyond killing their own people to gain a tactical advantage. It could have been fratricide, which is always possible, and likely; experiences in Iraq and Afghanistan bear this up, and the highly complex battlefield of the Syrian conflict make this also a possible explanation. It’s import because we know the Regime is responsible for Ghouta, and those responsible must face justice in time, and if the Opposition is responsible for Khan al-Assal then we all need to be on our guard; because if the Opposition have Sarin, so does AQ and ISIS and this would now be a global threat which we all need to be resilient against. Chemical weapons first appeared in the Syrian conflict at Sheikh Maqsoud in March 2013, and that was when I first became involved in trying to collect evidence of their use. There are still some people who dispute that chemical weapons were or are used in Syria, and more who do not believe Assad is to blame. However, as an expert with 27 years’ experience in this field, having been to Syria a number of times and analysed samples from these attacks, I have no doubt that chemical weapons are being used, and that the Assad regime is responsible. Samples from Sheikh Maqsoud and Saraqeb in May 2013 did eventually find their way to French and UK government laboratories and tested positive for the nerve agent sarin, with David Cameron saying as much in the summer of 2013. So by 2015 HBG has forgotten the incidents in Khan-al-Assal and Uteybah on 19 March 2013 and his role in collecting samples that were reported to be from one of them. Instead he states that Sheikh Maqsood, wrongly dated as March, was the first incident. In 2013 HBG was even prepared to consider the possibility of an opposition false flag in Khan-al-Assal, and to warn that opposition possession of sarin was a "global threat". In 2015 the incident and the global threat has disappeared down the memory hole, even though the threat of jihadi attacks in Europe causing mass casualties has materialized. The reason may be that Hersh's reports have made clear to those behind the CW operation that a solid trail of forensic evidence exists that links Ghouta to Khan-al-Assal and establishes at the very least their collusion with the Ghouta massacre. Was HBG working for MI6? This is a key part of the jigsaw because it links two information operations: the HBG operation to collect samples for MI6 and simultaneously provide comments to the media as an independent expert; and a BBC journalist who appears to have been part of an operation to fabricate a case for war on Syria. Readers of Robert Stuart's blog will be familiar with the evidence of fabrication in Ian Pannell's reporting of the alleged napalm attack in Urm-al-Kabra on 26 August for the BBC. His report was first broadcast on 29 August during the House of Commons debate, but too late to shift the vote. In HBG's comments on the Brown Moses site on the final OPCW report on Ghouta, released in December 2013, HBG makes clear that he was present with Ian Pannell at the site of the alleged chemical attack in Saraqeb (29 April), reported on the BBC on 16 May. The UN/OPCW also looked at Khan al-Assal and Saraqeb and concluded that Sarin was used in both events. I covered the Sarin attack with the BBC’s Ian Pannell and concluded without doubt, that the Regime was responsible, and we didn’t have any detailed chemical analysis kit with us. But the CW was tipped out of a helicopter, without doubt, and the Opposition certainly did not posses helos and the Regime did. It was apparent to me from the symptoms I saw and talking to those around that this was a Sarin attack. The UN/OPCW had the same and better evidence, and could, mandate aside, also have attributed blame. I covered the Sarin attack with the BBC’s Ian Pannell and concluded without doubt, that the Regime was responsible, and we didn’t have any detailed chemical analysis kit with us. But the BBC report presented HBG as an independent expert who was not at the scene. Hamish de Bretton-Gordon is a former commanding officer of the British Army's Chemical Counter Terrorist Regiment who now runs a firm that specialises in the study of chemical weapons. He has not visited the site, nor has he been able to test any of the alleged evidence. But he has studied previous claims and videos and was given full access to all the footage, transcripts and the interviews we gathered to give his assessment. He describes the "virtually identical events" that have taken place in Otaybeh, Adra and the Sheikh Massoud district of Aleppo in recent weeks. He says that taken together, "[you] start to come to the conclusion that you have strong evidence, albeit incomplete, that sarin or a nerve agent has been used in Syria recently over the last four to five weeks". Samples of soil, blood, urine and hair have been taken. They hold the best clue as to what happened in Saraqeb. What it will not do is determine who is responsible and for Mohammed Khatib it is all too late. Pannell could reasonably defend concealing HBG's presence on the basis that HBG was on a secret MI6 operation: but then of course he should not have misled BBC viewers by stating that HBG "has not visited the site" and presenting him as an independent expert. A question not yet asked on Robert Stuart's blog is how far in advance the fabrication of the napalm playground incident was planned. It's hard to imagine that a crew including professional make-up artists, two UK doctors, and a Dutch-Armenian woman could have been in place on 26 August without at least a week's advance planning. This suggests that whoever planned the fabrication knew in advance that a pivotal incident to make the case for war would happen on 21 August. We might also wonder how such a crew could have been assured that they would be safe in Nusra-controlled territory. He mentions Otaybah, Adra and Sheikh Massoud, but not Khan-al-Assal where the story is not so convenient. "Samples of soil" unlike physiological samples of course reveal a great deal about how the sarin was produced and who was likely to have produced it. If HBG had been briefed on the results from the environmental samploes he provided to Porton Down from the 19 March attacks, he would have been aware of this. On 15 March 2016 HBG gave a seminar at University College London from which a brief description was posted online. This seminar was given by former Army officer, Mr. Hamish de Bretton-Gordon. Hamish is currently a chemical weapons expert to NGOs working in Syria and Iraq. His seminar topic was the use of chemical weapons by ISIL and Assad. Since the Syrian conflict started, Hamish has been deployed to the conflict area a number of times, where on behalf of OPCW (Organisation for the Prohibition of Chemical Weapon) he has helped set up a CBRNE task force. Additionally, he helps run 32 hospitals and clinics across Syria, where he has trained doctors how to treat chlorine casualties and how to collect evidence that can be further used in a court of justice. His efforts in Syria also include training civilians how to protect themselves against chemical weapons. Hamish shared his experience on sampling and analysis of chemical warfare agents in Syria. He explained that sampling in war zones can be a challenging task due to various factors such as a violent environment, limited amount of time that can be spent on the scene, uncontrolled scene and limited equipment available. Finally, Hamish covered different chemical weapons that he has encountered in the Syrian conflict zone, such as chlorine and sulfur mustard. Chlorine, a “choking agent” that has been used for the first time on a large scale in WW1, has been used in Syria in a series of attacks in April 2014. Sulfur mustard, a “blistering” agent, has been used in eight attacks on Kurdish forces from Northern Iraq just in the last two weeks of February 2016, causing more than 200 casualties. From this we learn that HBG was setting up a task force "on behalf of" OPCW at the same time that he was apparently working for MI6 and his companies were receiving covert funding. We can reasonably infer that he and his network were a key source of the "evidence" provided to the OPCW and JIM reports on the alleged chlorine attacks in 2014. This is consistent with what he told the Telegraph about his role in training "Dr Ahmad" (quoted above). The implications are obvious. In this talk to the All-Party Parliamentary Group Friends of Syria, HDBG states clearly that he collected CW evidence for OPCW from the alleged chlorine attacks. This confirms what we suspected: the OPCW reports relied on "evidence" provided by an MI6 agent. He also mentions that he is working with Saleyha Ahsan, whose role in the fabricated BBC story on the napalm playground attack has been examined in detail by Robert Stuart. With David Nott, and also international human rights lawyer Toby Cadman, and the A&E doctor and BBC doctor Saleyha Ahsan, we set up an NGO called Doctors Under Fire to try and make sure, or to try and point out to the world, that targeting hospitals and doctors seems to have become the norm in modern warfare, as have things like the use of chemical weapons and things like napalm. My involvement in Syria is very much with UOSSM which is an international medical charity, a British, French, Canadian charity, and US charity, and we run a number of hospitals across Syria. Secure Bio was incorporated on 29 June 2011 in Manchester, three months before HBG retired from the army. It looks as if the first injection of capital into the company was on 10 April 2012, when shares were allotted. Further allotment of shares, presumably corresponding to injections of capital, were made in April 2013 and April 2014. The other director (apart from HBG) was Andrew Duckworth who appears to be just a nominee director (45 other directorships) with no relevant expertise (chartered surveyor). Nominee directors are typically used to hide the real control and funding of a company. Company formation agents will usually have a list of such people who can be trusted to do what they're told with other people's money, even when there is no formal contract between the nominee director and whoever is really behind the company. "Loans" that are never repaid are commonly used to hide funding. There are no accounts for Secure Bio made up to later than end of December 2013. These are "total exemption small company accounts" so very little information is given. The accounts from 2012 to 2013 show a progressive increase in unsecured debt, ending with £730k of unsecured debt and £15k of assets when liquidation began in June 2015. Most of this debt was £358k of "Directors' Loans": Andrew Duckworth was owed £305k and HBG was owed £58k. It appears that HBG moved to Avon Protection in October 2014. "Trade and Expense" creditors were owed £275k: this includes £108k of debt to John Townsend, an accountant. It's not clear how such a small company could have run up £108k of unpaid bills from an accountant: maybe there were some complicated arrangements to be made. Secure Bio Forensics was incorporated on 27 April 2012, and the only other director was Andrew Duckworth who was sole shareholder. The address was Griffin Court, 201 Chapel Street, Manchester, M3 5EQ which looks like a placeholder address for dummy/shell companies (about 300 at this address). It never had any other address. The balance sheet showed liabilities of just £1 at winding-up. It looks as if this company never did anything. Summary comments: It looks as if these companies didn't really go live until April 2012, when there was an injection of capital and a split of shares in Secure Bio, and Secure Bio Forensics was set up as a separate entity. It's possible that Secure Bio Forensics was intended as the vehicle for funding the collection of samples in Syria, but later it was decided to provide this funding some other way. Stories in the media that Assad had used or was about to use CW began in July 2012, leading to Obama's "red line" declaration in August 2012. It appears that the whole operation was transferred to Avon in October 2014, but the company wasn't put into liquidation until eight months later. Since the 1990s analytical chemistry has been transformed by wide use of mass spectrometry, in which chemical compounds are converted to ions and the mass/charge ratio of these ions is measured. Mass spectrometry is usually combined with gas chromatography, which separates compounds by their retention time when passed through a column filled with polymer. The combination of retention time and mass/charge ratio gives each compound a unique "signature". When GC/MS is used to detect CW agents in environmental samples, it gives a complete chemical profile of the sample, including impurities. The most sensitive methods can detect these impurities at concentrations of less than one part per billion. In physiological samples, GC/MS is used to detect adducts of sarin or its breakdown products with blood proteins, usually albumin or butylrycholinesterase (BChE). These tests can detect sarin several weeks after exposure, but don't reveal anything about the chemical profile of the sarin. Annex 2 of the report of the OPCW Scientific Advisory Board meeting in September 2012 includes the report of the Temporary Working Group on Sampling and Analysis chaired by Dr Robin Black, head of the detection lab at Porton Down. Pages 22-23 describe a study in the TNO lab that demonstrated the feasibility of using environmental samples for attribution studies. Sarin was one of the three CW agents studied. A summary was presented to the full Scientific Advisory Board. The reference to "an improvised laboratory" makes it clear that they have non-state actors in mind. So everyone on the SAB was aware that the environmental samples collected in Syria in 2013 would provide a forensic trail to how the sarin had been produced and who had produced it. AGENDA ITEM EIGHT – Chemical forensics (attribution) Chemical profiling of chemical warfare agents for forensic purposes. 25. Daan Noort of the TNO Health, Security and Safety Laboratory, Rijswijk, Netherlands, presented on a collaborative project, between TNO and The Netherlands Forensic Institute (NFI), on attribution studies of chemical warfare agents. The goal of this project is to assist forensic investigations in attributing an agent found at the scene of an incident to a particular source. Key questions are: (a) can the synthetic route be deduced from the composition of the by- products in the CW sample? (b) can a correlation be made between chemical profiles of crude samples, found in an improvised laboratory and at the site of the crime? (c) what is the stability of the chemical profile, over time, on various matrices and under various conditions? 26. Studies with VX were reported. VX was synthesised according to three different methods, but with no purification of intermediates or end-products. Analysis was performed with GC-MS and DART. The conclusions were: (a) Chemical profiles of crude VX samples remain more or less intact upon prolonged storage, and after spiking in/on various matrices. (b) Correlation of chemical composition of specific batches (crime scene vs laboratory) should be feasible. (c) Chemical profiles of crude VX samples are indicative for a particular synthetic route. Similar results were obtained for sulfur mustard and sarin. It was noted that small changes in the synthesis protocol might have a large impact on the chemical profile of the end product. Russia's OPCW-designated lab for detection of CW agents is the Laboratory for Chemical and Analytical Control in the Military Research Centre of the Russian Ministry of Defence. The lead scientist at the lab was Professor Igor Rybalchenko, who had served on the OPCW Scientific Advisory Board with Robin Black since 2008. Rybalchenko and his colleagues clearly have high regard for Robin Black: in a 2009 paper they cited his "pioneering work", perhaps hoping that he would be the reviewer of their manuscript. 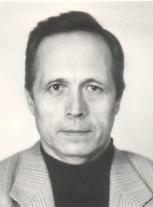 In a 2009 article Rybalchenko is described as a senior scientific adviser to the Russian government, in connection with the destruction of the former Soviet chemical arsenal in specially-built facilities for which the US government provided most of the funding under the Nunn-Lugar program. The results of the analysis clearly indicate that the ordnance used in Khan al-Assal was not industrially manufactured and was filled with sarin. The sarin technical specifications prove that it was not industrially manufactured either. The absence of chemical stabilizers in the samples of the detected toxic agents indicates their relatively recent production. Churkin made further comments on video answering questions, including those on Western investigations. shell and soil samples contained nerve agents – sarin gas and diisopropylfluorophosphate – not synthesized in an industrial environment, which was used by Western states for producing chemical weapons during World War II. We highlight that the Russian report is extremely specific. It is a scientific and technical document containing about 100 pages with many tables and diagrams of spectral analysis of the samples. Our report on the Aleppo incident of March 19 is available to all the members of the UN Security Council, and I think it is even available to the general public. It is a very professional report, and we have no doubt that the sarin gas used in the March 19 attack near Aleppo was homemade. Also, we have intelligence that the chemical weapon used in the infamous August 21 incident was sarin gas of roughly the same origin as the chemical used on March 19, only in a higher concentration. We sent this data to our US partners and the UN Secretariat. the Syrian government asked Russia to conduct an investigation [into the Khan-al-Assal attack] by Russian experts. They arrived on the spot, gathered samples and examined them in Russia, in an OPCW-certified laboratory. A comprehensive report was prepared and submitted to the UN SG and our P-5 Security Council colleagues. Sellstrom got acquainted with this report and even traveled to Moscow to discuss it with Russian experts. In his report of December 12 Sellstrom does not refute our conclusions which are the following: on March 19 "home-made" sarin was used near Aleppo, the projectile that was used for sarin delivery was also a cottage industry product. Besides, as our experts concluded, sarin used on August 21 was of approximately the same type as the one used on March 19, though of a slightly better quality. It means that over a few months opposition chemists somewhat improved the quality of their product. The Russian report appears to be suggesting that diisopropyl fluorophosphate (DFP) might have been intentionally synthesized as an alternative to sarin. Robin Black's 2016 review of the history of CW agents provides a possible explanation for this: UK and US chemists were less successful in developing a nerve agent during WWII. The primary candidate was DFP, studied by Saunders and colleagues at Cambridge University. DFP had toxicity approximately one fifth to one tenth that of sarin, with volatility closer to soman. Its only advantage over sarin was ease of synthesis. If a "cottage industry" operation could only manage to synthesize sarin at something like 5% concentration but could easily synthesize DFP at tenfold higher concentration, and the objective was to generate something that would test positive for sarin but also cause casualties, it might make sense to add DFP to a very low-quality sarin preparation. This appears to have been the Russian lab's interpretation of what they found. However the material would have had to contain at least some sarin, or it wouldn't implicate the regime. One of affiliations, 27 Научный центр МО РФ--27th scientific centre RU MOD, possibly this, but not explicitly to do with chemistry. Hersh's original story in the LRB has been updated in subsequent interviews with Democracynow and Telesur. It's clear that one of his sources is Dempsey or someone very close to him. Another is a "senior defense intelligence official" now retired, and another is a UN official likely to be Mokhtar Lamani. The most recent version of Hersh's story is as follows. From April 2013 onwards, the DIA had information from multiple sources indicating that the Syrian opposition has CW agents, and specifically that the Nusra Front was producing sarin from precursors procured in Turkey. A five-page briefing note was produced on 20 June 2013 for David Shedd, the DIA Deputy Director, with the title "Al-Nusrah Front-associated sarin production cell is the most advanced sarin plot since Al Qaida’s pre-9/11 efforts". 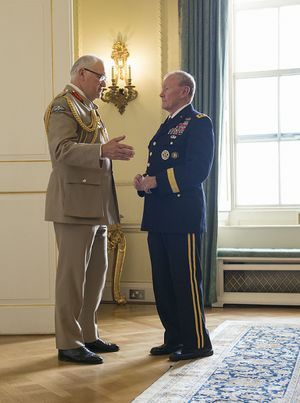 A collaboration was established between three generals who had supposedly got to know each other professionally as tank commanders in Germany during the Cold War: Martin Dempsey, then the CJCS, Sir Peter Wall, then the head of the British army, and a Russian who can only be Valery Gerasimov, chief of staff of the Russian Armed Forces. Russian military intelligence obtained environmental samples of the sarin used in the Ghouta incident. Some of this material was supplied to Wall, who took it to Porton Down for analysis. Wall communicated the results of this analysis to Dempsey. The results showed that the sarin was "kitchen sarin" without stabilizers, and did not match what was known of Syrian military stocks. Dempsey then visited Obama to inform him of this, and to warn him that he would testify to Congress on what he had told Obama. This forced Obama to call off the attack that had been planned to start on 2 September, the official line being that he had decided to seek Congressional approval. Subsequently, when Syria's sarin binaries were destroyed on board the MV Cape Ray, a ship fitted out by US Army engineers for destruction of CW agents, the US was able to confirm that the chemical profile of the sarin binaries in Syrian military stocks did not match that used in Ghouta. 1. In the original article, Porton Down's role is represented as not much more than that of lab technicians: it was supposedly US defence intelligence who deduced that the chemical profile did not match Syrian military stocks. 2. The story about how the Russian samples reached Porton Down changes between versions. In the original article, Wall is not mentioned and the samples were passed to "British military intelligence". In the Telesur interview, Hersh says "he" gave the samples to Peter Wall (then corrects "he" to "they") and that Wall took the samples to Porton Down. This implies that Wall took a considerable personal risk: he would have had to meet with a Russian diplomat to collect the samples and take them in his car. This is clearly false. This, taken together with the earlier version in which it is the DIA who work out that the results do not show Syrian military-grade sarin, suggests that Hersh's sources are trying to cover up the role of Porton Down, most likely to protect them from retribution. The relationship between Gerasimov and Dempsey was confirmed by Dempsey himself in an address to Irish officers in 2015. The continent is in a period of high risk, the chairman said, because of the potential for miscalculation. 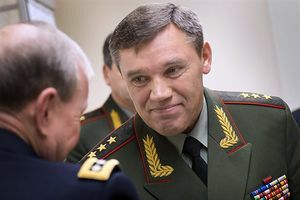 He said he tries to keep in touch with his Russian counterpart Army Col. Gen. Valery Gerasimov. “I’ve actually suggested to him that we not end our careers as we began them,” Dempsey said. As a young armored cavalry officer, the chairman served in West Germany at the same time Gerasimov was a tank commander in East Germany. The Wall Street Journal reported: Five Navy destroyers were in the eastern Mediterranean, four poised to launch scores of Tomahawk cruise missiles into Syria, according to military officials. Officers said they expected launch orders from the president at between 3 p.m. and 4 p.m. Eastern Time on Saturday. 7 pm: Obama calls meeting of White House national security staff in his office (Hagel and Kerry not present) to tell them the attack is off. 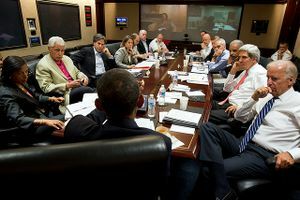 9 pm Obama phones Hagel and Kerry separately, to tell them the attack is off. The following morning a meeting of the full National Security Council, with Kerry and Dempsey present, was held followed by a press conference to announce the decision to postpone the attack. A report posted by Wayne Madsen on 1 September stated that Dempsey had made a secret visit to the White House to force Obama to call off the attack. This was reported to be independently confirmed two days later by Andrew Kreig, an attorney and investigative journalist, who appears to be a more reliable source. Wayne Madsen's reporting record indicates that he is often a conduit for stories originating with Russian intelligence: though these stories may be disinformation, they frequently include accurate side information. So the content and the source of this story corroborate not only the assertion that Dempsey forced Obama to call off the attack, but also confirm that the Russians knew what Dempsey was doing. On Tuesday 2 September Dempsey, together with Kerry and Hagel, testified at a Senate Foreign Relations Committee hearing on Syria. The NYT reported: As for General Dempsey, who has made clear his skepticism about military action in lengthy letters to Congress, he appeared to want to disappear behind his medals and ribbons. Looking down, offering monosyllabic answers, and dispensing with an opening statement, the general left little doubt that he was simply carrying out orders. In a PBS documentary broadcast in May 2015, the story has changed, and the walk in the Rose Garden with McDonough is moved to the following morning. Dempsey is quoted as part of this altered version: It was a Friday night, and I got a call from the president of the United States. And he said to me, “I am considering an alternative course of action.” And he wanted me overnight to consider whether a delay would in any way affect our ability to be effective with our military options. Hersh's story that the chemical profile of the Ghouta sarin showed it to be kitchen sarin without stabilizers is corroborated by the limited information available in the OPCW reports and assembled by sasa wawa on the WhoGhouta blog: the sarin contained no stabilizers, contained ethyl groups indicating impure low-quality reagents, and contained hexafluorophosphate indicating that the synthesis started with elemental phosphorus or phosphorus trichloride and that intermediate reaction products were not purified at each step. Syria's sarin synthesis is known to have started from trimethyl phosphite. Syria procured hundreds of tonness of trimethyl phosphite from the UK and India in the 1980s, and still held 60 tonnes in stock in November 2013, when they declared their stockpile to OPCW. There is an analytical laboratory on board the Cape Ray containing GC–MS instruments. Before the hydrolysis begins ‘analytical chemists in this laboratory will verify the identity of the neat agent, ensuring the chain of custody at the point of destruction,’ explains Forman [Science Policy Adviser to OPCW]. One criticism was that it was implausible that Porton Down and the US/UK military would have trusted the integrity of samples provided by the Russians. This is not hard to explain. If the Russian lab report on Khan-al-Assal made available to permanent UNSC members in June had been passed to Porton Down for expert review, Porton Down would have been able to compare their own results on the sample from the 19 March attacks with the Russian findings. If their results agreed, this would have confirmed the integrity of the Russian samples. A more interesting question, not asked by Hersh's critics, is: why did the Russians trust Porton Down to report their findings accurately? Higgins also points to Dan Kaszeta's attempted rebuttal of WhoGhouta, in which he argued that Syria could have been producing low-quality sarin without stabilizers for battlefield use, and to Coghlin's tweet described below that "MOD sources; no doubts expressed by Porton Down on quality of sarin found in the soil sample". Of course these two propositions contradict each other. Obviously – to adapt Patrick Armstrong’s ‘QED’ – if Hersh had been wrong about the Porton Down tests, Coghlan could have found a spokesman from the laboratory to say so. Moreover, if they had in fact decisively established the guilt of the Syrian Government, the MSM on both sides of the Atlantic – with the ‘Times’ in the lead – would have been trumpeting the fact to the skies. So, inadvertently, Coghlan provided confirmation that one of Hersh’s most significant – and in some ways puzzling – claims was true. A review of the history of chemical warfare by Robin Black in 2016 stated simply: "the use of sarin was confirmed in the internal conflict in Syria, although the UN investigative mission did not identify the perpetrators". Just before the House of Commons met to debate the motion on war with Syria, the JIC issued a letter to the Prime Minister to set out the case that the regime was to blame for Ghouta and for earlier alleged chemical attacks. We have assessed previously that the Syrian regime used lethal CW on 14 occasions from 2012. This judgement was made with the highest possible level of certainty following an exhaustive review by the Joint Intelligence Organisation of intelligence reports plus diplomatic and open sources. This assertion that "judgement was made with the highest possible level of certainty" that the regime was behind the earlier CW attacks directly contradicts HBG, their agent on the ground, who had repeatedly stated that that rebels could have been responsible for Khan-al-Assal and other attacks. Of course the JIC knew that their case for war would have collapsed if there were any suggestion that the rebels could have been behind earlier attacks using sarin. (2) Porton Down's expert evaluation of the report from the Russian Military Science Lab. The level of technical detail in this report was enough for an expert to review. (3) the DIA report dated 20 June quoted by Hersh which reported the existence of a Nusra sarin production cell. There is therefore a strong case that the JIC misled the House of Commons to make the case for war. This is contempt of Parliament, a crime against the constitution. - shell and soil samples contained nerve agents – sarin gas and diisopropylfluorophosphate – not synthesized in an industrial environment, which was used by Western states for producing chemical weapons during World War II. This page was last edited on 17 March 2018, at 21:46.